GEWO Balsa Carbon 775 is a modern OFF blade featuring the latest high-tech materials. 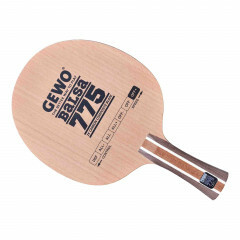 GEWO Balsa Carbon 775 is one of the fastest blades from the GEWO blades range. The 7.75 mm thick Balsa centre ply produces all the power and speed you need for your attacks, without neglecting control and reliability in passive situations. The soft, vertical-cut balsa ply in combination with premium-end 1K-Carbon make the blade a true "Power Tool" for uncompromising attackers. Low-trajectory high-speed topspins and aggressive blocks will give your opponents the shivers. Gewo Blade Balsa Carbon 775 is beeing added to cart.